Taiwan is on high alert ahead of the arrival of "near-perfect" super typhoon Nepartak, expected to slam into the island early on Friday morning local time. 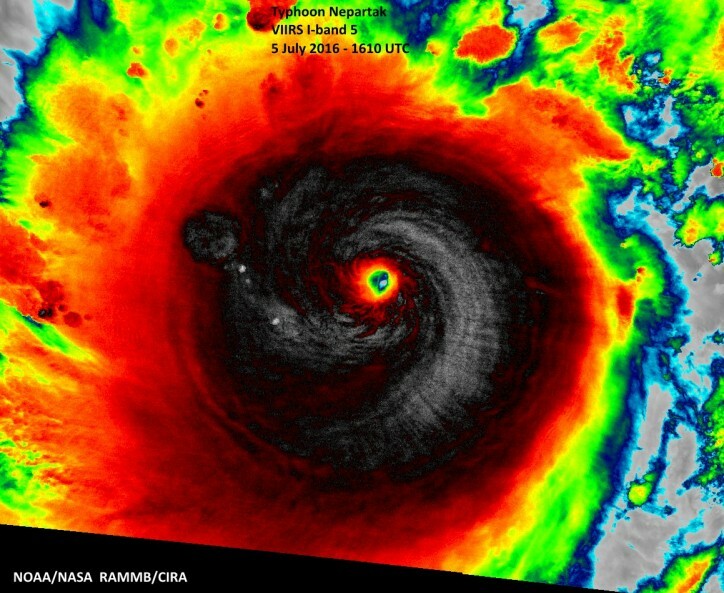 Currently surging at speeds of up to 280 kilometers per hour (170 miles per hour) with gusts reaching even higher than that, the typhoon has grown almost as strong as 2015's super typhoon Soudelor which caused billions of U.S dollars of damage in Taiwan and China and killed at least 36 people. Thousands of troops have been mobilized across Taiwan and emergency services ramped up, according to a Ministry of Defence spokesperson. Central Emergency Operations Center spokesperson Li Wei-sen told CNN authorities were concerned about potentially widespread flooding, particularly in the eastern counties of Yilan and Hualien which will be the first hit. Nepartak will be Taiwan's largest super typhoon in about six years and the first for 2016, both for them and the entire northern hemisphere, after an unusually quiet storm season. Until now, the northwest Pacific had experienced its longest streak on record without a named storm, totaling 200 days since December 2015. On social media meteorologists and storm chasers have been sharing their awe over the shape and size of super typhoon Nepartak, describing it as a "near-perfect" storm. Flooding rains in excess of 900 millimeters are expected to fall in parts of Taiwan when the typhoon makes landfall, which is already causing waves of up to 14 meters at sea, according to the Joint Typhoon Warning Center. Food prices in Taiwan jumped ahead of the typhoon, local media reported, while transportation minister Ho Chen Tan promised Taoyuan International Airport would be able to withstand a direct hit from the storm. More than a fifth of all daily flights out of the airport have been delayed or canceled due to the extreme storm, the airport announced, before the super typhoon had even made landfall. Taiwan Power Company is currently estimating power outages for more than 3.1 million households. Spokesperson Li said further plans for evacuations would be decided on Thursday morning, with announcements made later in the day. On Thursday, Cathay Pacific announced the airline would be suspending all flight operations in Taiwan from 6 p.m. Thursday, local time, until Friday afternoon -- all flights between those times were canceled. Nepartak is likely to maintain its super typhoon status up until it reaches Taiwan and currently is the equivalent of a category 5 hurricane (253 kph or 157 mph). Although the east coast of Taiwan isn't heavily populated, the rugged terrain of Taiwan enhances the risk of flooding and landslides during tropical cyclones. Nepartak originally formed in the open waters of the Pacific on Sunday, south of Guam, and has been steadily moving to the northwest -- it's currently forecast to reach Taiwan at about 2 a.m. on Friday morning, local time. Expected to make landfall in China on Saturday morning, super typhoon Nepartak will bring further devastating rainfall to south-eastern China, which is already reeling from its worst flooding since 1998. 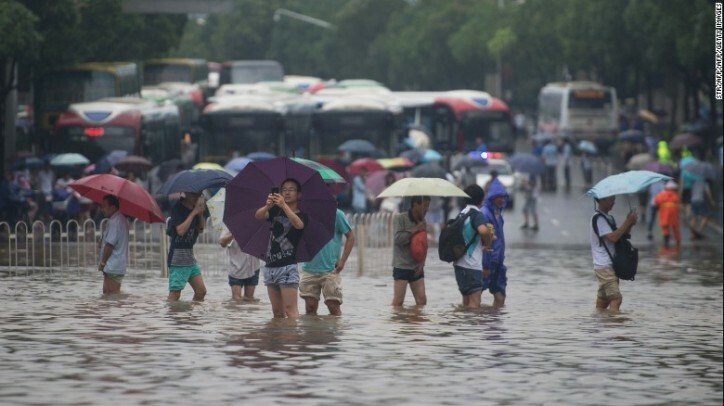 At least 140 people have died across 11 provinces in China since June 30 as a result of heavy flooding, according to the latest numbers from the country's Ministry of Civil Affairs. China Meteorological Administration issued an orange typhoon alert on Thursday, the second highest alert in the system, and recommended all outdoor gatherings be suspended and schools closed. Fujian, Zhejiang, Jiangsu, Jiangxi, Anhui and Shanghai are all expected to be affected by the storm. Although super typhoon Nepartak will have lost some of its power due to land interaction by the time it reaches China, it will still be a formidable storm. 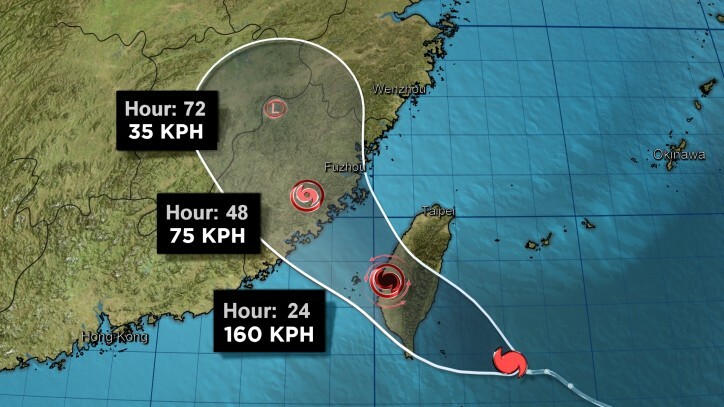 According to the Hong Kong Observatory, while the super typhoon will have been downgraded to typhoon level by the time it makes landfall, wind speeds could still be up to 120 kph (75 mph). An estimated 23 million people have already been affected by floods, hailstorms and landslides, the Ministry of Civil Affairs said, while China's Flood Control Department said the country was experiencing its worst flooding since 1998.